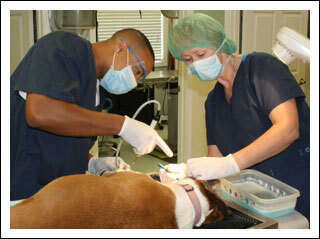 In the event of a pet emergency during normal office hours, contact Gadd's Animal Doctors of Gray at (478) 986-3784. If you are calling after hours and get our voicemail, follow the recorded instruction to arrange for emergency care as needed. Gadd's Animal Doctors of Gray provides a comprehensive array of emergency services including sugical intervention, critical care and post trauma rehabilitation. When you contact GADOG for emergency care services, you can rest assured that our first priority will be to take immediate action to save the life of your pet. We are able to treat a wide range of emergency situations in our state-of-the-art facility including blunt force tramua, cuts and wounds, poisoning, infections, heat stroke and caesarean section. In addition, the expert staff at GADOG is fully equipped to administer to the needs of large and exotic animals as well as household pets.